Below are some common questions and good information. Feel free to contact us at anytime if you have further questions about guiding, our school, or our experience. Why Choose Royal Tine Guide School? Choosing Royal Tine as your guide school will pioneer the path to a new career for you, a future where you can live and work in the rugged outdoors! Ask about our rating, our curriculum, the instructors, the location, job placement services, and our references. Then you’ll know why you want to choose Royal Tine! 1. We’ve been rated the best guide school in the West by Western Big Game Outfitters. Read about Royal Tine in Backpacker, Outside, American Cowboy, National Geographic Adventure, and Peterson’s Hunting magazine. ** In operation since 1994, Royal Tine is the oldest continuously operating guide school in Montana! We’re not the best because we’re the oldest – we’re the oldest because we’re the best! 2. Our curriculum is specifically designed to train students in the essential skills — the skills that outfitters are looking for in employees. As a result, Royal Tine graduates are in demand. ** Enrollment is limited to 8 per session, so classes are small and every student gets plenty of personal instruction. ** We run the toughest curriculum of any guide school out there. We’re busy from 6:00 am to 8:30 pm, and we have class 6 days per week. 3. Job placement is 100% for all qualified graduates! We have the reputation for turning out some of the best guides in the business, so many outfitters hiring guides and packers call us first! 4. Our instructors are professional hunters and packers, with over twenty years of experience teaching the required skills. 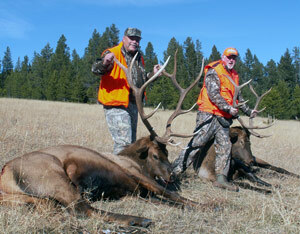 Royal Tine’s owners have guided and packed in Montana, Idaho, Wyoming, Arizona, and Alaska. Thus, students benefit from their broad range of experience and professionalism. 5. Our location in the Sapphire Mountains is incredible! The Royal Tine Guide School, set in a lush meadow with towering pines and streams running through, simulates a high mountain, backcountry hunting camp, complete with wall tents and a large cook tent. Wildlife often travel through camp – elk, deer, moose, wolves, bears, and an occasional mountain lion. In this setting you’ll live and learn how to pack, guide, and cook outdoors. 6. Our references are superior! We hope you’ll take time to call them! They are our best form of advertising and a great way for you to get to know us in advance. Also, here are some testimonials from our spring class! Think long and hard about what you want in a guide school. We’re confident you’ll choose Royal Tine! We look forward to meeting you in the near future! What are some of the jobs available in an outfitters camp? STUDENTS SEEKING EMPLOYMENT MUST UNDERSTAND that hunting skills alone do not make a good hunting guide. Successful guides, and all other employees, must develop excellent public relations skills (“people skills”) because this is a service industry. Today’s outfitter demands and deserves a camp staff that makes every possible effort to ensure that the client has an enjoyable and successful trip. Outfitters are on the lookout to hire skilled and good natured people who are responsible, dependable, willing to work, and enthusiastic about treating their clients right. Understanding the importance of hospitality towards clients, and teamwork with co-workers is a must. Without the right attitude you will not make it–no matter how good your skills are. No outfitter will risk valuable clientele, his business, on an employee who cannot or will not demonstrate the “right stuff”. Job descriptions differ with employers. Some outfitters expect guides to cook for clients. Other outfitters provide full-time cooks to prepare almost all meals. Most outfitters will expect their crew to be flexible no matter what there job title. First year guides and packers should be prepared to chop wood, clear trail, do camp chores, do a little cooking and kitchen detail, care for stock, and “baby-sit” a camp, etc. Hunting Guide–primary duty is to locate game and get his hunter close enough for a good shot. He must have a thorough knowledge of the animal he seeks; be able to properly field dress, skin and cape and care for game meat. He needs to be in top physical condition, able to walk many miles in rough terrain, often under adverse weather conditions. Excellent “people skills” are a must. Fishing Guide–advises clients on fishing tackle, technique, and the hot spots for good fishing. Packer–loads and transports supplies, gear and game on pack mules or horses and normally is in charge of taking care of his string (stock). A packer must also be in top physical condition and able to lift loads weighing 100 pounds or more. He needs to enjoy working with horses and mules and be easy going and levelheaded to cope with the inevitable frustrations and emergencies that occur when handling animals. Wrangler–rounds up livestock, takes care of feeding, grooming, and saddling. He needs to be good with horses and mules. He will usually be required to do other camp chores. Camp Cook–prepares, serves, and cleans up after meals for clients and crew. A good one must be highly organized, very neat and clean, and enjoy putting some effort into turning out a good home-cooked meal whether for 6 or 16. Sometimes the cook plans menus and orders food and supplies. The cook often works both in camp and on the trail and must be flexible and able to cope without modern conveniences. The cook is also often the camp jack and stock “vet”. Camp Jack–is responsible for fuel and water supply, camp maintenance and a wide variety of camp chores. Most outfitter camps keep a lot of equipment and supplies on hand. Every item must be kept neatly stored and in good working order to be available at a moments notice. What are the pros and cons of jobs with an outfitter? It is exhilarating to live and work in the backcountry in much the same way as the mountain men did 100 years ago. For some, it is a personal test; you find out what you are made of when you leave civilization and match your wits with nature. There is a certain satisfaction in a job that requires both brawn and brains. Not only can you reach the peak physical condition of your life, you can also find that the challenge of camp life captures your heart. Those that love life in camp, usually find a way to make it their life’s work. It is a brotherhood: learning to share the wilderness with all walks of life, developing the teamwork approach to anything nature can dish out, and the satisfaction one feels from leaving behind the world of time clocks, traffic jams, and the 6:00 news. On the flip side of the coin…there are low wages to start, very long hours, sore tired muscles from very hard work, weeks or months of living in a tent with no modern conveniences, and coping with heat, rain, snow and very cold weather. You will handle frustrating livestock and find they always get fed before you do. In the big game hunting season you can expect little free time and few, if any, days off; not to mention the times you would like to stay inside your warm sleeping bag…but cannot. This is a job you will either love or hate. The only way you can find out whether it will be for you…is to do it. What can I expect for the first year in employment and wages? Outfitters want proof that you have the staying power to make it through a season without leaving them high and dry in the middle of a hunt. Wages for first year guides generally range from $1000-$1500 per month plus room and board. In most camps, you will have no living expenses (except personal items) so your earnings should be sizeable at the seasons end. Experience counts in this business; you have to earn your place in camp. If you are self-motivated, sharp on your skills and have good work references, you may be able to make minimum $2500 per month within 2 or 3 years as a hunting guide. Also, tips from your clients are usually a significant extra. Is there year-round employment in a guiding career? Yes…in a variety of ways. 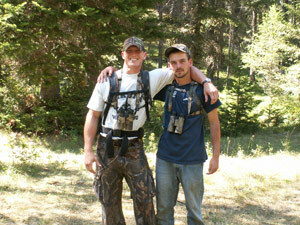 Experienced people can find jobs with year-round outfitters, dude ranches, working ranches and government agencies. Others may choose to combine employment in related guiding fields (hunting, fishing, river trips, skiing, snowmobiling, etc.) to fill out their year. Still others work in different regions as they follow hunting and fishing seasons around the calendar and country. Some guides just work one or two seasons a year to finance the rest of the year in school, traveling, or with their families. The job market is as wide as your imagination. How do I get licensed as a guide? This course will provide you with the opportunity to learn everything required to become a licensed guide, wrangler and packer. Upon graduation, you will be given a detailed written evaluation of your skill level and employment potential. Guide licensing requirements vary from state to state. A guide license is issued by the state guide and outfitters board and must be signed by a legal, licensed outfitter of that state. I have no hunting experience. Can I become a hunting guide? Yes. No one is born knowing how to guide for big game. Everybody has to learn. But do not kid yourself. There is no school anywhere that can turn a totally inexperienced person into a qualified big game guide in one summer course. Good hunting and guiding skills take time and experience to develop. There are no shortcuts for learning to hunt. There is no mandatory time limit other than however long it takes you to learn what you need to know. I have some hunting experience. Do I still need professional training? Yes…and for a good reason. Having “some” hunting experience can range from shooting a few rabbits when you were a kid, to a lifetime of hunting several weeks a year, and harvesting a wide variety of big game animals on a regular basis. The time you have hunted is not as important as your skill at it. Realistically, you will be hard pressed to find an outfitter who will hire anyone who does not have good employment references as a guide, or a good report from a completed training program. Outfitters need to hire people they can depend on to do any necessary task that arises in or out of camp, day or night, and they will not have to train you on the spot. An outfitter either has to evaluate your hunting abilities for himself or take the word of a reputable school’s final evaluation report. Guiding clients is different than hunting for yourself. Take those skills you have learned on your own and polish them in a good training program. Learn the techniques of a pro and learn how to modify your own methods to compensate for the differences your client may require. Also, a guide is required to do a lot more than simply guide hunters. What can I do to study and prepare in advance? Outdoor magazines and books will broaden your outlook; there are many theories on hunting. Other good advance work: strengthen your hiking muscles and trim off any excess weight. If you smoke, quit…or at the very least, cut way down.